Ooma and VoIPo are two prime examples of the flexibility that residential VoIP offers to consumers. Ooma has always set itself apart from traditional phone providers and other VoIP providers by having the customer pay upfront for the hardware and pay little for the service. If you want, you can get their service for no more cost than the monthly taxes, or you can pay a little extra and get Premier, which has more features. VoIPo also gives you the option of paying upfront costs and savings over the long term, although they give you a free lease on the hardware rather than letting you buy it. VoIPo offers many hosted PBX-like features for the home user. Ooma offers unique hardware, giving you new ways to use your home phone. Today we’re going to compare Ooma with VoIPo. Ooma has a business model that is unique in the world of VoIP: Pay upfront for the hardware, and get free phone service for life. Ooma sells the Telo, which is their adapter, for $149 MSRP, although if you look online you can get it for $129 refurbished. They give you a free 60-day membership to Ooma Premier with activation, to give you a taste of the premium features. Ooma then continues to tempt you to buy more hardware, like their $50 Bluetooth/Wi-Fi adapter, which allows you to connect wirelessly to your router anywhere in your home, or the $50 Linx, which lets you wirelessly connect up to four legacy phones to your Telo, or the $60 HD2 Handset, which has HD Voice. Much of the hardware they sell is available as a free gift if you upgrade to Premier for a $100. It’s pretty easy to talk yourself into getting a one-year subscription to Ooma Premier. VoIPo makes money on their service rather than their hardware. You can pay month-to-month, but to really take advantage of their savings, prepay $149 for two years. It’s one the best deals in residential VoIP today. They only have one level of service, but they offer more VoIP features than Ooma, even Ooma Premier. Their service closely resembles business hosted PBX on a small scale. Ooma offers exclusive features as well. Premier subscribers can screen their calls using the Telo like an old-fashioned answering machine. They can also integrate Ooma with Google Voice. Ooma Premier subscribers also get 250 free minutes per month on the Ooma Mobile App. For an additional $4.99/mo, you can also get voicemail transcription. 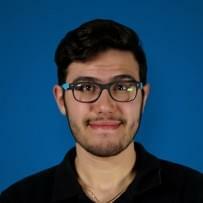 You have to already have Premier to get transcription, so it can be an expensive option. VoIPo also has a few tricks up its sleeve that Ooma can’t match. One feature is distinctive ringtones. Although it isn’t as fancy as you’ll hear on your smartphone, you can get the phone to ring in different patterns depending on who is calling. VoIPo also offers call routing, also known as call treatments. Depending on who is calling the call can go through, go to a second number, or be disconnected automatically. They even offer outbound call rules. The best example I heard is a that father picks certain phone numbers his children shouldn’t call, and the calls go to his cell phone instead. VoIPo includes 60 minutes of international calling for free every month, and Ooma Premier subscribers get unlimited free calling to Canada. For $7.95/mo, VoIPo subscribers can upgrade to 1200 included international minutes. Ooma’s international plan is $17.99/mo, and includes unlimited calling to 61 countries. Ooma Basic subscribers get no international minutes, although the per-minute costs of international calls are the same for Basic and Premier subscribers. Ooma and VoIPo handle faxes differently. The Ooma Telo is compatible with legacy fax machines. They don’t offer any compatibility guarantees or even a list of approved devices, though, which is disappointing. 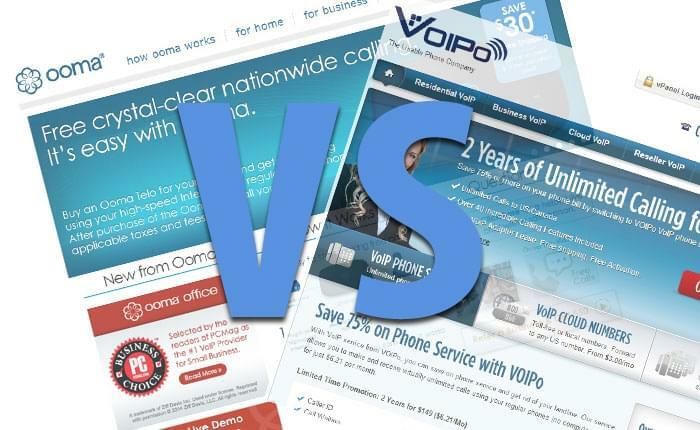 VoIPo has a fax-to-email service that will cost you $4.95/mo or $36/yr. One of the biggest differences between the two is the mobile app. VoIPo doesn’t actually have an app at all, but they do give out the SIP address. If you’re tech-savvy enough, you can program a softphone, like Bria, Acrobits, or Zoiper, and use that as your mobile app. Ooma is much more straightforward, but it’s only available for the iPhone. The app is free to download, but you have to pay for minutes. You can make calls for a flat 1.6 cents per minute, or get 1,000 minutes for $4.99/mo. Premier subscribers get 250 app minutes included. Ooma and VoIPo also have US-Based phone support. Ooma’s hours are Monday-Friday 7am-7pm Pacific, Saturday-Sunday 8am to 5pm Pacific, Holidays 8am to 5pm Pacific; VoIPo’s hours are 8AM-4PM Pacific Time Monday-Friday. If you go purely by phone features and price, VoIPo takes a slight edge. 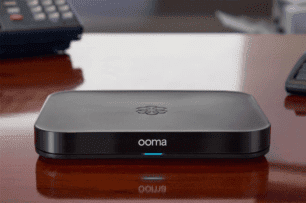 A year of VoIPo is less than a year of Ooma Premier, and offers just a few more features. 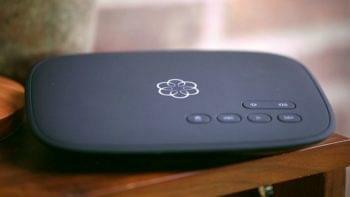 But Ooma’s big feature is the number of goodies that they sell, all of which can add to your home calling experience. If you’re willing to go light on features, you can’t beat Ooma Basic on price, which is free once you buy the Ooma Telo. For an individual on a budget, I’d defintely recommend Ooma Basic, but for a family, I like the full suite of features that VoIPo gives you. 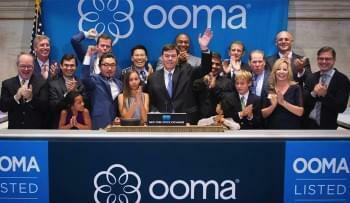 Could Ooma Crash & Burn?